When I was a starving graduate student, I used to read the East Bay Express religiously. It was a small, independent, free paper -- like the Stranger here in Seattle. It even had the "Savage Love" column … and introduced me to Rob Brezsny's "Free Will Astrology". I kept seeing a small display ad for a handmade leather bookbag for $79, with a slightly larger size for $99. I decided that, as a grad student, I deserved a good-looking bag. So I called the artist -- I wish I knew who he was! -- and arranged to visit his studio, in an industrial area in Oakland. He showed me the two size options, two options for buckles, and then showed me a bunch of leather hides to choose from. I chose a smooth black leather, paid half the price of the bag, and left. Two weeks later -- probably less -- I went back, paid the remainder, and picked up the bag. It really was the bag of my dreams -- simple, clean lines, an inner zip pocket, roomy enough for a laptop. I carried it every day for years and years. 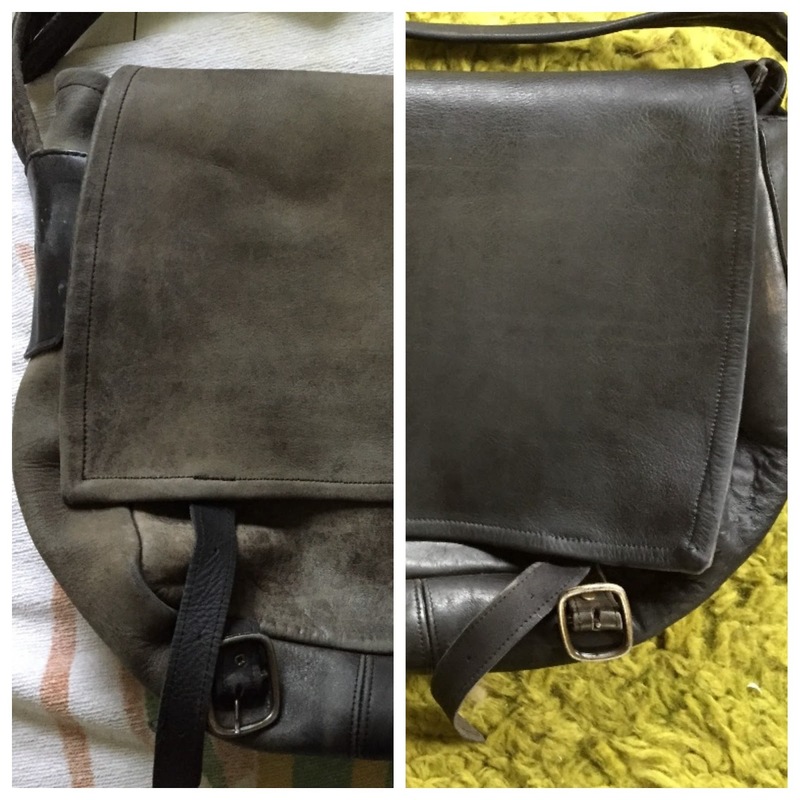 Over time the leather got pretty beat up, and the bag faded to a distressed light gray. It was still the PERFECT bag, but I stopped carrying it. Recently Wil and I were talking about bags. He covets my black Filson Field Bag -- a weird sample that one doesn't see very often. I sort-of covet his small leather bag he picked up at KOBOSeattle at Higo, but it's not big enough for my purposes. 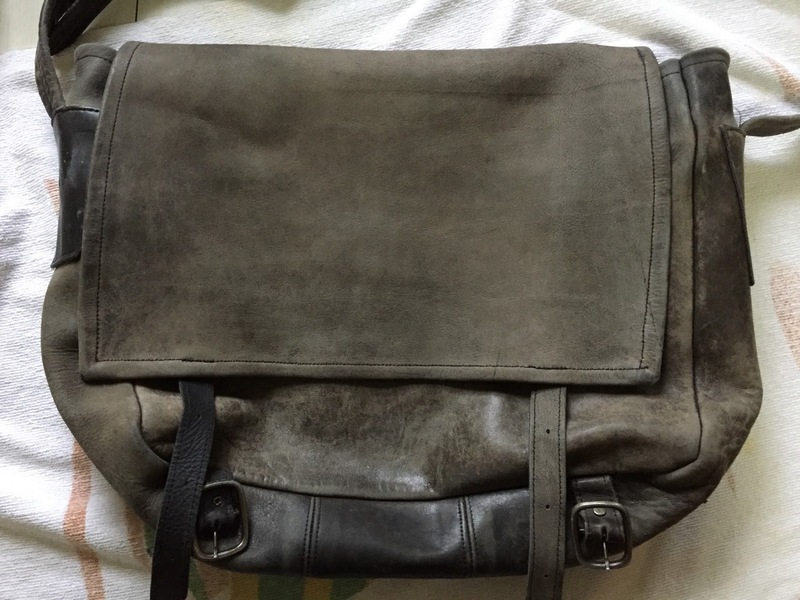 I do love my Filson bag -- it's a beauty -- but it's not quite perfect. 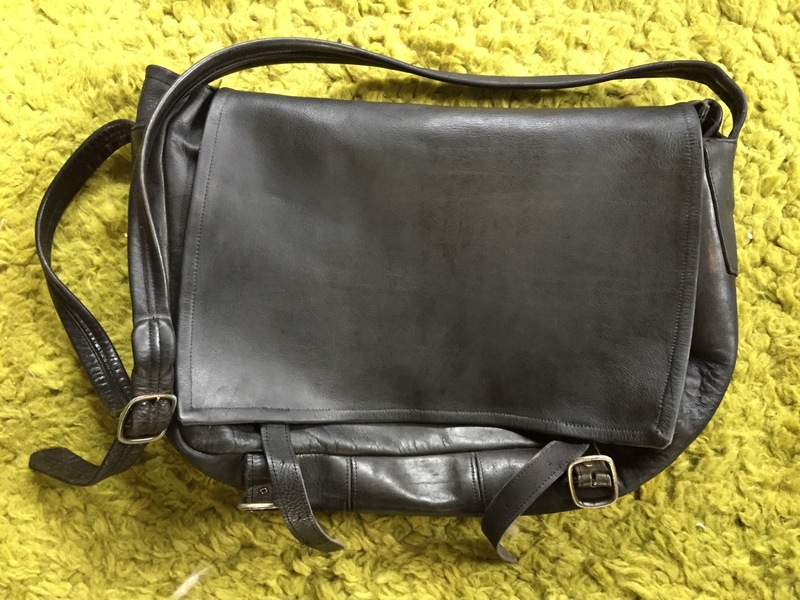 My leather bag, however, *is*… almost. 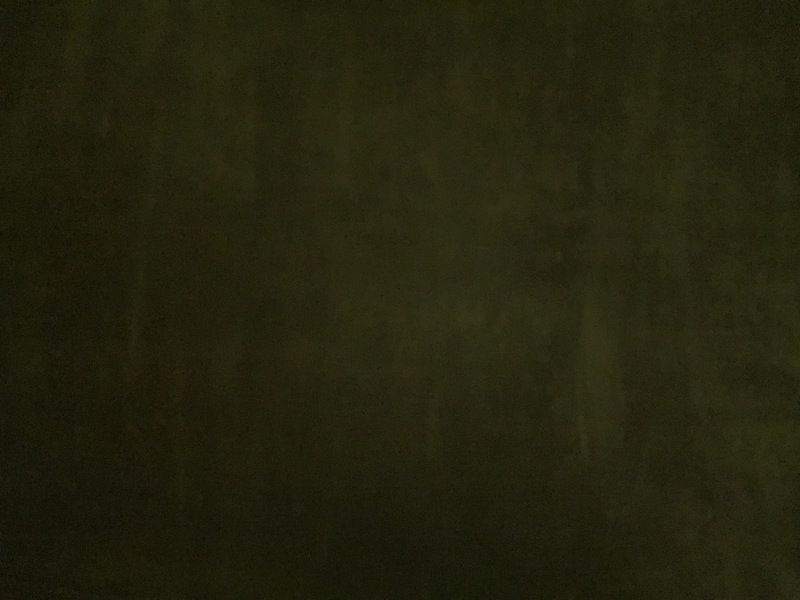 It's just not black anymore. I said, "I wonder if there's leather dye for bags" -- realizing, as I said it, that OF COURSE there is leather dye. 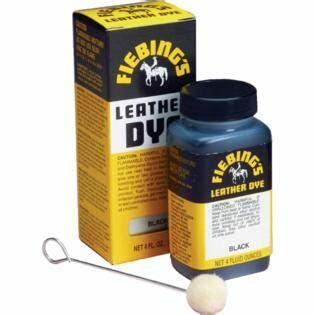 We looked it up on Amazon and, sure enough, found Fiebing's Leather Dye. Reviews were good, so I bought the "set" -- the Deglazer (to remove oil, dirt, and old stain), the Leather Dye, and the Resolene (to protect the finish). Over the weekend I cleared off the table, put down a couple of towels, and opened a bunch of windows … and set to work. I couldn't really tell if the Deglazer was "working" -- but it did seem to take off some of the color… and several of my brain cells. Imagine nail polish remover. Then concentrate it. Then surround yourself with it. We ended up opening the front door to get a cross breeze and clear out the stench. Then it was time to apply the dye. I'm not sure what I was expecting -- but I do know that since I was working with black I didn't have to worry too much about "matching colors". So I used the funny little sheepskin-tipped applicators and painted it on. The leather -- which was pretty dry -- seemed to really soak up the dye. I used about 2/3 of the bottle on this one bag. It was amazing just how black it got. I had been worried, somehow, about applying too much dye -- with the result that the front flap of the bag was a little streaky. Okay, more than a little streaky in bright light. Then another day later, I applied a coat of Resolene, the clear acrylic finish. I'm not sure what I was expecting -- would it be glossy? One coat seemed enough for most of the bag, but I ended up doing a second coat on the flap. Even that still left the bag feeling a little … dry. 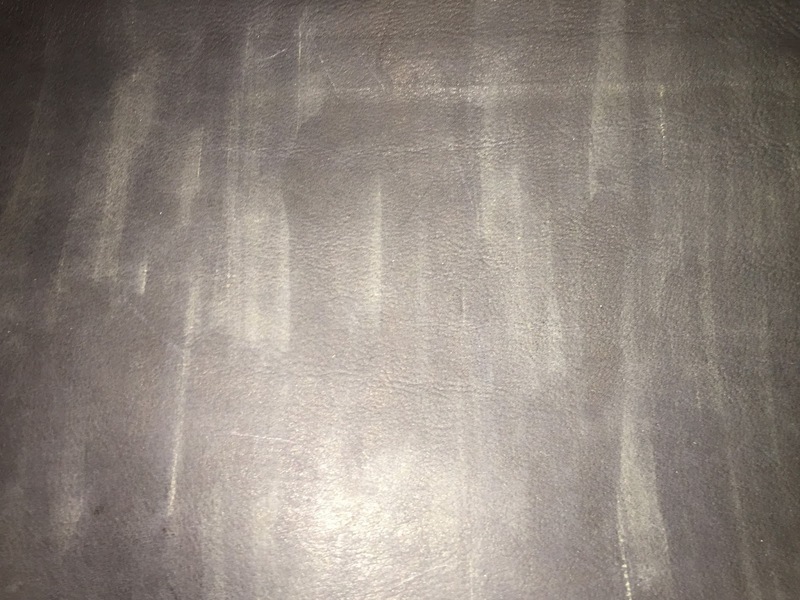 To be fair, the leather had been dried out and distressed, so just a dye-job wasn't going to solve the issue. I considered using something called "Leather Honey" -- which I suspect shouldn't be indiscriminately Googled -- but we tried using Dr. Marten's Wonder Balsam, which we already had at home. And, well, it worked wonders. Over the next week or so, when I remembered, I would rub in another bit of Wonder Balsam into the bag, and it got softer and shinier each time. I can imagine that I'll need to keep doing this every couple of months, but I'm still amazed at how great my old bag looks. The Fiebing's Leather Dye was easy to use, though admittedly just trying to get something black is easier than trying to hit a particular shade. 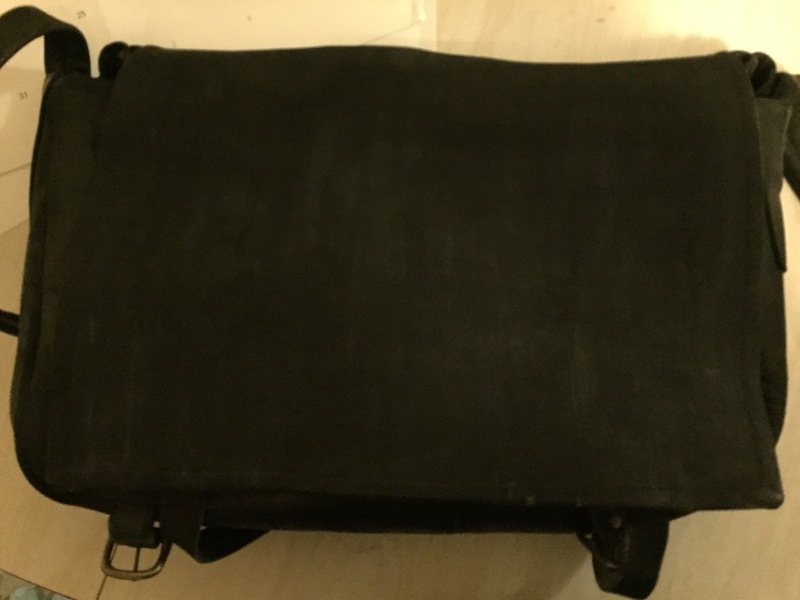 I'm not sure whether just reconditioning the leather would have re-darkened it, but I love how jet black my bag is again. 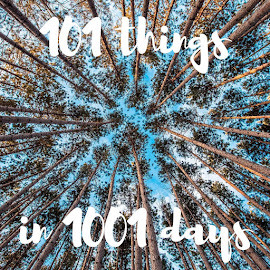 While this wasn't part of my #101in1001 project, it feels like a corollary to it -- and a huge success.